Lots of pundits are cautioning Obama and Romney against “playing politics” with the tragic aftermath of Hurricane Sandy. I disagree. I’d say if there was ever a time to play politics, now is it. If we do believe that, in the wake of this devastation we must redouble our efforts to prevent future tragedies such as this from occurring, then the most important thing we can do is to play politics. And the first step is to break climate silence. Even if our leaders are unwilling, it is time for us to speak up and face down the deniers. Please watch and share the clip above to everyone you know. Then help those who are advocating in no uncertain terms for public policies that will curb carbon emissions and promote alternative energies worldwide. This entry was posted in Energy Efficiency, Energy Policy, Environmentalism, Politics on October 31, 2012 by Rabbi Brant Rosen. On Sunday, we headed northwest, winding our way through a long, gorgeous mountain pass, to Volcanoes National Park, where we spent an incredible afternoon at the Iby’Iwacu Cultural Village. Iby’Iwacu was founded by Rwanda Eco-Tours, the visionary tour agency that has shepherded us along our trip (as well as our last one in 2008). During the course of our tour, we’ve been so appreciative of RET’s skillful readiness to help us organize such a complex and unorthodox tour of Rwanda’s NGO world. The real bread and butter of their organization, however, is their eco-tourism mission. Rwanda Eco-Tours was founded and is run by native Rwandans who are passionate about their country, their people, their natural resources and providing you with the highest quality yet educational tourism experience that responsibly contribute to the conservation of Rwanda’s beautiful natural resources – her parks, lands and indigenous animals, most notably the endangered mountain gorillas – as well as the development and socio-economic well being of local people. The Iby’Iwacu Cultural Village, one of RET’s signature projects, was founded to allow ex-poachers the opportunity to embrace conservation and cultural preservation, while still being able to make a living and strengthen the economic sustainability of their local community. It is quite remarkable to consider that this effort has allowed these local Rwandans, whose existence previously depended upon poaching and bush meat, to become transformed into environmental and cultural conservationists. 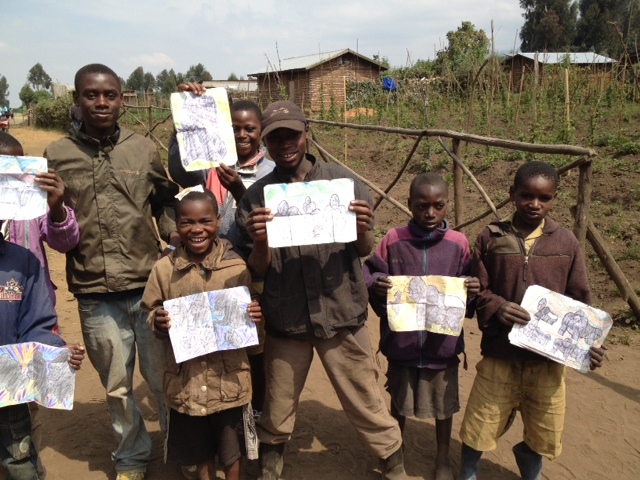 Immediately upon exiting the bus at the village, we were greeted by a wave of local children selling original crayon-drawn pictures of gorillas, elephants and other local species (above). 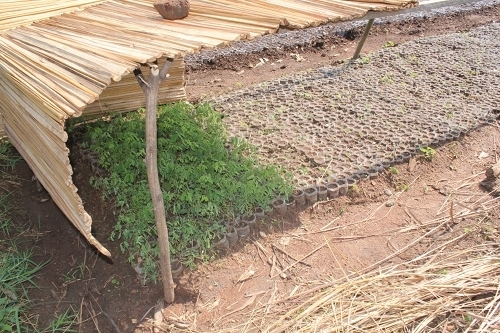 The compound itself was built to resemble a traditional Rwandan native village. We then met our guide, John, who started our tour in front of the King’s hut. In a semi-solemn ceremony, Rich was elected king, I was made King’s Advisor, and Katia Waxman, Queen. After the three of us were dressed in Rwandan royal finery, were were all walked through an interactive simulation of Rwandan social/political/cultural protocol. When we emerged from the royal hut, we were joyfully greeted by singing, drumming, dancing Rwandan “tribesmen.” After joining in the celebration (above), we were treated to a demonstration in a medicine man’s clinic and honed our native archery skills (below). Then the real celebration began. (See bottom pic and the fabulous clip up top). 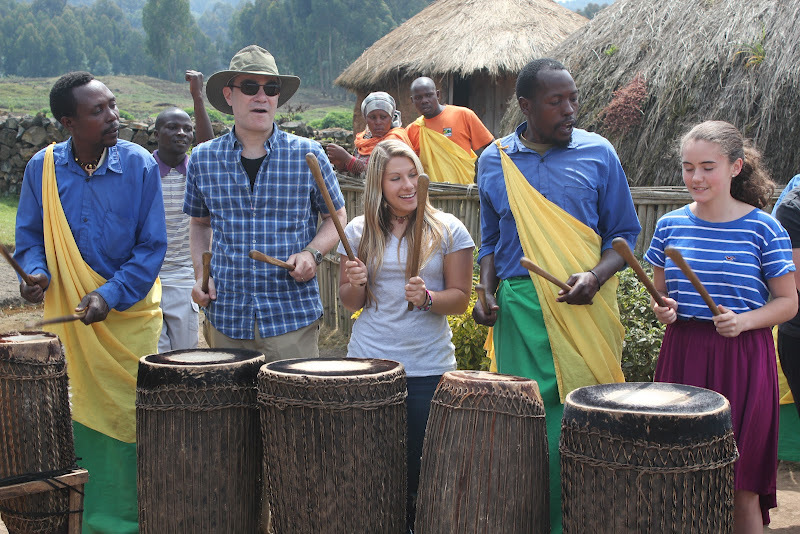 For anyone contemplating a trip to Rwanda, I can’t say enough about Rwanda Eco-Tours – an important agency that truly embodies the best of the eco-tour movement. And I highly, highly recommend a stop at Iby’Iwacu Village, a place that definitely hits the sweet spot between local community development, environmental conservation, cultural preservation and joyful abandon. This entry was posted in Africa, Economic Justice, Environmentalism, Global Activism, JRC Rwanda Trip 2012, Rwanda on July 20, 2012 by Rabbi Brant Rosen. The following post was written by JRC member and current trip participant Rich Katz, who also participated in JRC’s Uganda/Rwanda delegation four years ago. Before joining us in Rwanda on our current trip, he returned to Uganda to visit many of the people and NGO’s with whom we’ve been partnering. Below, he offers thoughts on his experience visiting our good friends at the Peace Kawomera interfaith coffee cooperative. Visiting East Africa for the first time with JRC in 2008 was a remarkable experience. We made many new friends and we were able to work with and support several grass-roots organizations in Rwanda that provide direct service to alleviate conditions of poverty, HIV-AIDS, and the plight of widows and orphans in a country scarred by genocide. 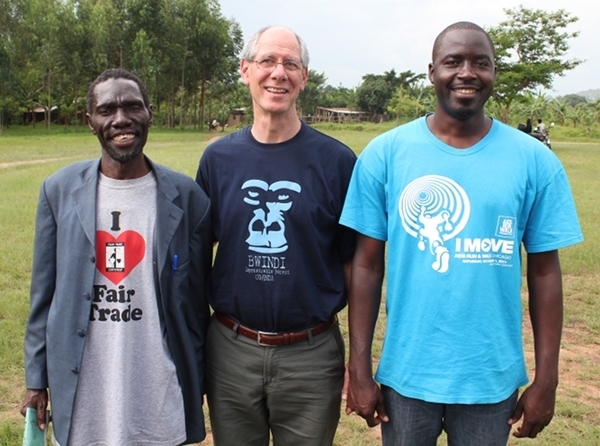 We also visited eastern Uganda to learn more about how the Peace Kawomera Cooperative Society is working to improve the lives of coffee farmers in the region. I returned there for a week before flying to Rwanda. The changes I witnessed were astonishing. Four years ago, the co-op numbered about 500 farmers who were producing and shipping one container of high quality Arabica coffee to the Thanksgiving Coffee Company in Fort Bragg, CA, where it was roasted, packaged and distributed. They had just received a significant grant from USAID to purchase and install a central “washing station”, which is used by the co-op’s farmers to remove the outer pulp of the ripe coffee “cherry”. 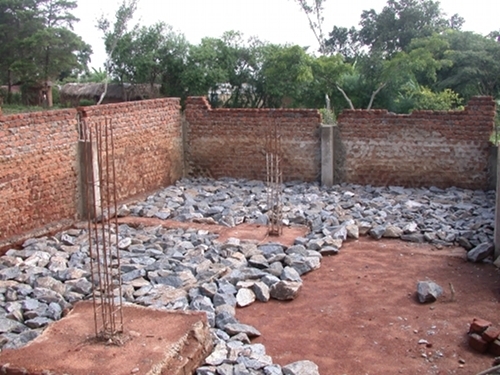 The money was also used to begin the construction of a warehouse & office building on the same site (below). Importantly , agronomist Johnbosco “JB” Birenge had been hired to train the farmers in more productive methods of growing coffee. Today, I’m happy to report that the PK membership has grown to nearly 3,000 farmers, and they now ship four containers of organic, fair-trade certified coffee to Thanksgiving Coffee. 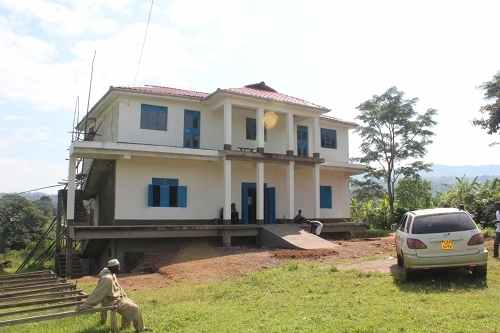 The warehouse/office building (below) is functioning—although the office space is not quite finished—and the farmers have expanded their crops to include vanilla, cocoa and cardamom. The staff now includes a credit union manager, an entomologist and a seed development specialist. However, not all is as rosy as it appears. The co-op is facing some unanticipated problems that require innovative solutions. First, the region is experiencing dramatic climate change that has pushed the harvest forward into July rather than late August, forcing changes in their other farming activities. Also, many farmers are increasing the land planted in cash crops by cutting down the shade trees necessary to grow good coffee and using them for firewood, charcoal and to fire bricks. Fortunately, JB, who is now PK’s managing director, was successful in securing a grant from the Stichting Progreso Foundation, a Netherlands-based organization that supports small holder producer organizations. The money is being used to purchase and raise seedlings (see below) that will be distributed to farmers for reforesting their land. In combination, the climate change and the loss of trees have meant that the annual rains are washing away the topsoil at an alarming rate. On the bright side, PK has obtained a letter of agreement with Natural Flavors (Newark, NJ) to buy all of their vanilla and cardamon once the growing and drying processes have been perfected. A second USAID grant application has been submitted to purchase a washing station large enough to handle the increased volume of coffee that is being brought in by the farmers. Among other things, the grant will also be used to establish a small “cupping laboratory” in the office building so that farmers can actually taste the coffee that they grow and learn how their farming practices affect the quality; increase the number of women-led producer organizations in PK from 15 to 20; hire six field facilitators, who will visit the famers more frequently for purposes of training and problem-solving; and establish a nursery to test different variety of coffee trees for quality and yield, resistance to pests, etc. All in all, the future looks bright for our friends at Peace Kawomera. Incomes are steadily rising, women are being given greater independence and authority, democratic institutions are being strengthened, products are expanding, and the quality of their coffee is outstanding. If you live in the Chicago area, head over to JRC and buy a bag of delicious Mirembe Kawomera coffee. You can also support their efforts by buying their coffee at the Thanksgiving Coffee online store. This entry was posted in Environmentalism, Fair Trade, Global Activism, Interfaith, JRC Africa Trip 2008, JRC Rwanda Trip 2012, Rwanda, Uganda on July 14, 2012 by Rabbi Brant Rosen. 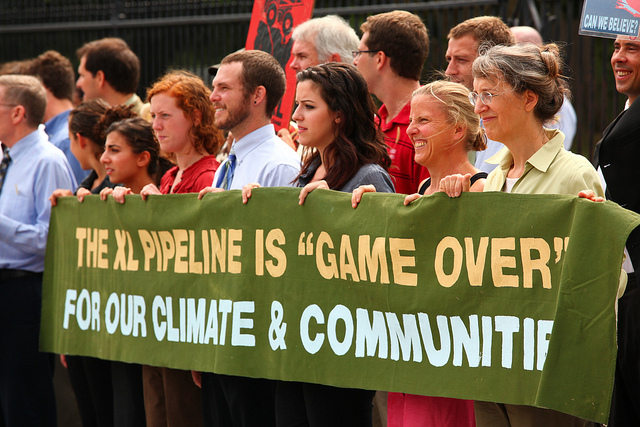 The Tar Sands Sit-In: Something is Happening! 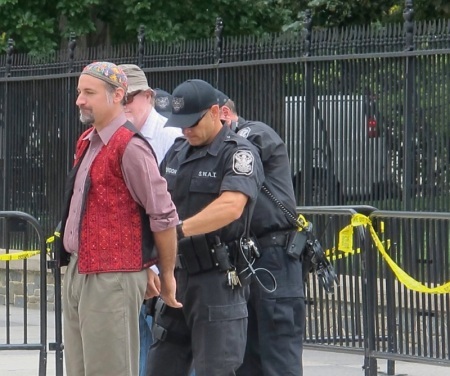 Have you been following the Tar Sands XL Pipeline Sit-In at the White House? This still-ongoing protest is being described as the biggest environmental civil disobedience action in a generation. It began on Saturday, Aug 21 and will continue until September 3. This action has already led to the arrest of almost 600 protesters to date, with crowds increasing every day. The Canadian oil and gas company TransCanada hopes to begin building a new oil pipeline that would trek close to 2,000 miles from Alberta, Canada to Texas. If constructed, the pipeline, known as the Keystone XL, will carry one of the world’s dirtiest fuels: tar sands oil. Along its route from Alberta to Texas, this pipeline could devastate ecosystems and pollute water sources, and would jeopardize public health. Giant oil corporations invested in Canada’s tar sands are counting on the Keystone XL pipeline to make the expansion of oil extraction operations profitable: The pipeline would double imports of dirty tar sands oil into the United States. Pollution from tar sands oil greatly eclipses that of conventional oil. During tar sands oil production alone, levels of carbon dioxide emissions are three times higher than those of conventional oil, due to more energy-intensive extraction and refining processes. The Keystone XL pipeline would carry 900,000 barrels of dirty tar sands oil into the United States daily, doubling our country’s reliance on it and resulting in climate-damaging emissions equal to adding more than six million new cars to U.S. roads. Before TransCanada can begin construction, the company needs a presidential permit from the Obama administration (no Congressional approval is needed.) Alas, Secretary of State Clinton is already on record as being “inclined” to approve the project and Obama has been ominously silent on the issue. Hence, this incredible, inspiring mobilization in DC. We must turn up the heat in a sustained effort against the scourge of climate change, which harms not just our land and water but people here and now, our human future and all earthly creation. Please: if you aren’t able to join the action, please consider signing this petition or just contact the White House directly. This entry was posted in Current Events, Energy Policy, Environmentalism, Nonviolence, Politics on August 30, 2011 by Rabbi Brant Rosen. Fracking in Illinois? Pass SB 664! Last January I addressed the serious ecological dangers of hydraulic fracturing (aka “fracking”) as a method for extracting natural gas from underground shale. At the end of the post, I noted with some alarm that a Louisiana energy company is currently seeking to lease hundreds of acres of farmland for fracking in Edwards County, IL. Advocacy time. A important new piece of legislation is now being proposed by Faith in Place, an Illinois interfaith environmental coalition. Sponsored by Sen. Michael Frerichs, it is called SB 664 (or the “Fracturing Chemical Disclosure Act.”) and is modeled after a ruling by the Wyoming Oil and Gas Conservation Commission. • Require companies extracting natural gas from shale in Illinois to disclose their chemical formula to the Illinois Department of Natural Resources and to the public. • Prohibit the injection of volatile organic BTEX compounds into groundwater. • Outline safeguards for storing and disposing of wastewater. In other words, SB 664 would require companies to disclose the chemicals they use in the drilling process. This way, if any polluted water or natural gas finds its way to a faucet, we will know exactly who put it there. And we can hold them accountable. Faith in Place is looking for more legislative sponsors—and citizen support—to pass SB 664. If you live in Illinois, please click here to learn what you can do. This entry was posted in Energy Policy, Environmentalism, Politics on March 14, 2011 by Rabbi Brant Rosen. Those who care deeply for the welfare of the earth have been watching with alarm at the growth of hydraulic fracturing (aka “fracking”) throughout the US. Fracking (yes, fracking) is a means of extracting natural gas that involves drilling deep into the earth, through the aquifer into hard shale deposits. During the process, a pressurized mixture of water and chemicals is injected into the rock, causing a kind of mini-earthquake. Natural gas is then released through the cracks, eventually making its way to the surface, where it is piped to compressor stations. During the compression process, toxic chemicals are burned off into the air while the used chemical fluid is either sent away or stored in on-site pits where it evaporates. The rest of the chemical fluid, however, remains deep underground. 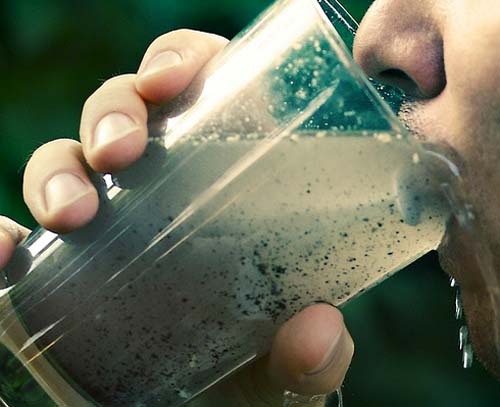 As you might guess, communities where fracking takes place have reported increasing incidents of water contamination, environmental degradation and serious health problems. State and federal agencies have received thousands of complaints from people all over the country whose lives, homes and communities have been literally poisoned by fracking operations. This entry was posted in Energy Policy, Environmentalism, Movies, Politics on January 27, 2011 by Rabbi Brant Rosen. Celebrate and Take Action This Tu B’shvat! It’s utterly frigid here in Chicago. As I lose feeling in my toes, however, the Jewish calendar tells me it’s Tu B’shvat: the Birthday of the Trees, and the first harbinger of Spring. That consciousness acknowledges that while a certain tree, forest, or mountain itself may not be holy, the life-sustaining services it provides — the oxygen we breathe, the water we drink — are what make existence possible, and so deserve our respect and veneration. From this point of view, the environment becomes sacred, because to destroy what is essential to life is to destroy life itself. 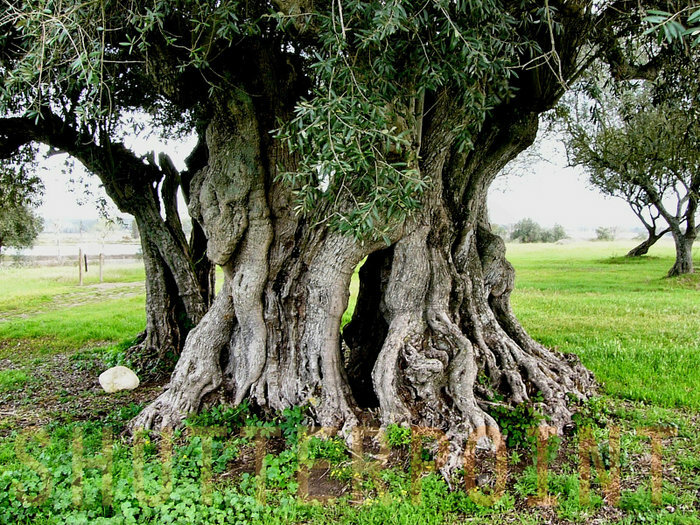 This entry was posted in Environmentalism, Human Rights, Israel, Palestine, Peace, Spirituality, Tu B'shvat on January 20, 2011 by Rabbi Brant Rosen.